By 2020 it is estimated that one in three British workers will be over the age of 50 years, according to statistics published by The Work Foundation. 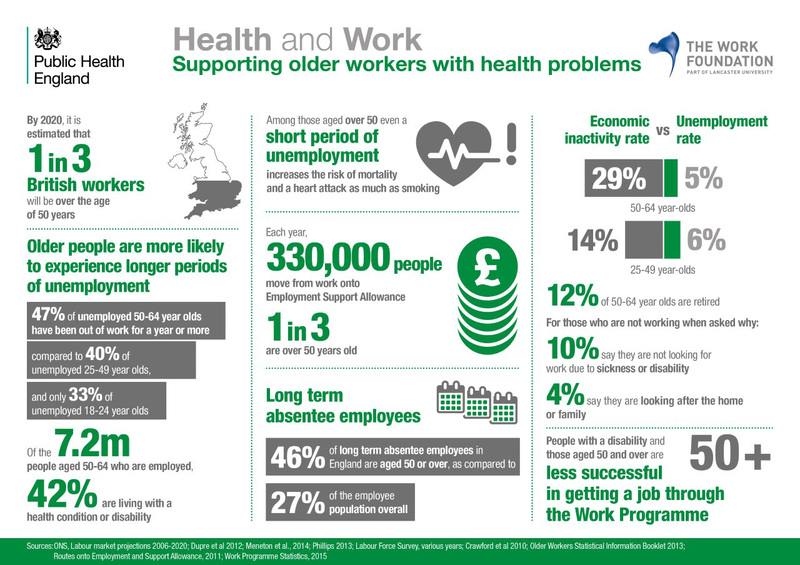 However, currently, older people are more likely to experience longer periods of unemployment: 47% of unemployed 50-64 year olds have been out of work for a year or more, the effects of which are that among those aged over 50 even a short period of unemployment increases the risk of mortality and a heart attack as much as smoking. It’s clear the workplace needs to become a more older-worker-friendly environment, but what needs to change in order to make that move beneficial for both employers and employees? The increasing age of the working population is creating unprecedented challenges for organisations and governments, according to Workage, a three-year EU-funded project that aims to inform social policy guidelines about engagement and retention of older workers through the application of workplace interventions. Until now, policymakers have sought to retain older people in employment by raising the retirement age and, in some countries, by legislating against age discrimination in the workplace. At the same time, many employers and pension funds have reduced retirement benefits, especially during the recession. Such measures have made an impact but they also ignore the nature of work itself. Experience shows that forcing older people to remain in unsatisfying jobs, or to remain in jobs that they are no longer able to perform, is not the best solution for anyone involved. Workage, which is led by Nottingham Trent University with Workplace Innovation Ltd, aims to demonstrate that targeted workplace interventions to improve job design and work organisation can facilitate enhanced engagement and retention of older workers and produce wider benefits for the organisation and its employees. Its baseline survey identified the work-related factors that are associated with job satisfaction, workability and work engagement. It was found that increased job autonomy, reduced mental job demands, supervisor support, and a positive organisational climate are associated with job satisfaction. Physical demands brought by the job was identified as a major factor linked to work engagement and workability. trust among colleagues, and a sense of community within the workplace.